Deploy manufacturing optimization solutions 80% faster than before ? Find good solutions faster than ever, and solve harder problems than previously possible ? Quickly turn business requirements into user-facing business solutions ? Supercharge your other core and analytics solutions — no need to “rip and replace” to accelerate business ? Embed your unique requirements in the solution — not what a software vendor decided ? Learn More. 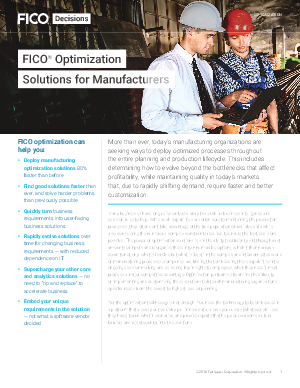 Download the FICO Executive Brief Now.